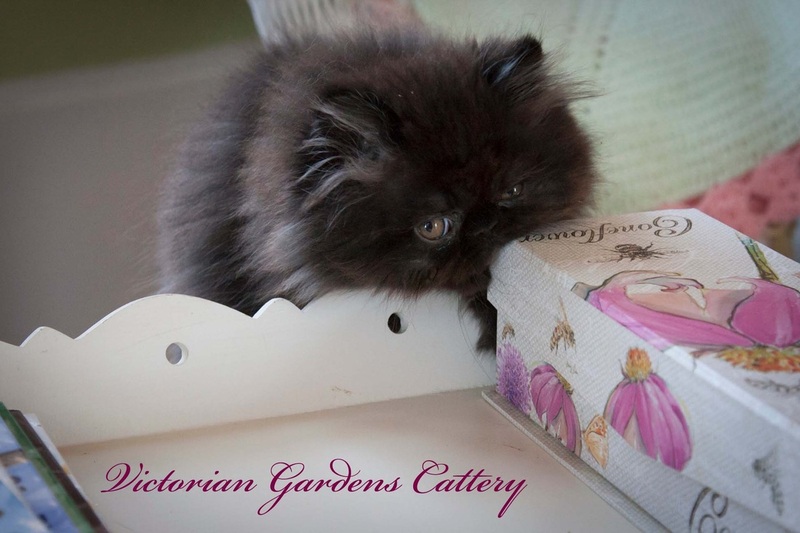 Last week we held our Victorian Carriage Photo Shoot with Pansy's kitten, Saffron. You can click on the picture to be taken directly to his photo shoot. Saffron is scheduled to leave the Cattery for his new home on June 15, 2014. We will miss this sweet boy. He was a joy to have at the Cattery. 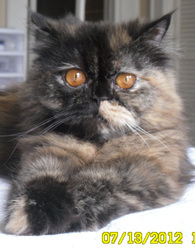 Saffron, an Extreme Face Black Persian. May 25, 2014. Courtesy of D. Russo Photography. 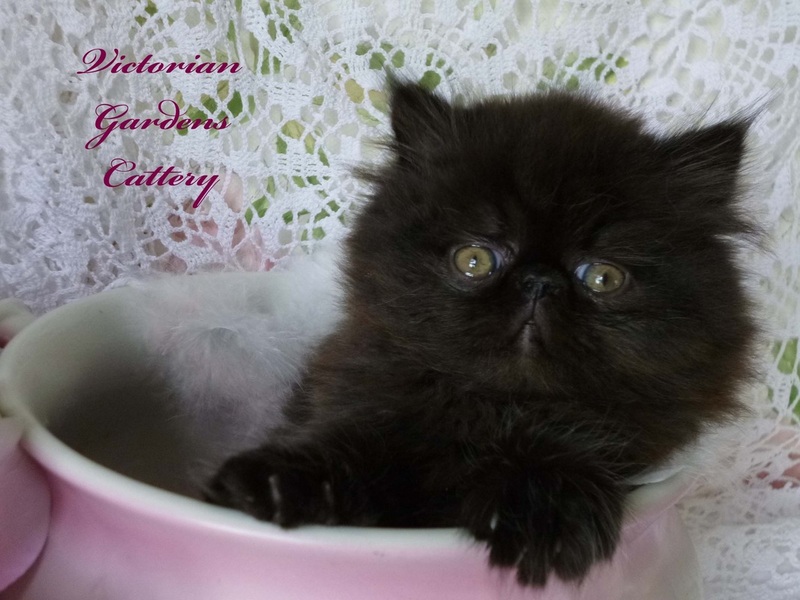 On May 18, 2014, Schann Westbrook came from Cary, North Carolina to visit her new little girl, Marigold, a Black Tortoiseshell Persian from Primrose and Willie's litter that was born on March 6, 2014. She had been on the Priority Wait List since February 2014 so she was able to see this litter be born and grow up through photos and YouTube videos. Little did we know when she arrived for her visit, that Schann was a Photographer. She graced our home and our kittens with her sweet and gentle way. It was a very relaxing 3 hours spent loving on all the babies and taking these marvelous photos of Primrose and Pansy's litters. She was able to capture the colors of Primrose's rare litter of all Tortoiseshells, including the unique coloring of the Chocolate Tortoiseshells and Chocolate Tortie Point Himalayan. We will be featuring our favorites of this photo shoot on Schann's own page of our website entitled, The Feline Photography of Purry Paw Prints. Thank you Schann for a great time with the gang at Victorian Gardens Cattery. You can see her fabulous photo shoot by clicking here. You can also click on the picture to go to the Photo Shoot. Pansy's black baby is featured in these videos along with Primrose's all Tortoiseshell litter who are about 11 days older than him. Click the link to go directly to the YouTube video. 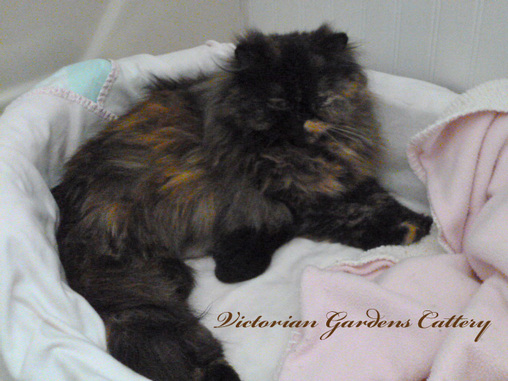 You can see more of Primrose's all Tortoiseshell litter in Primrose's Nursery 2014. Please click on the picture to go to the pictures in the Photo Shoot. 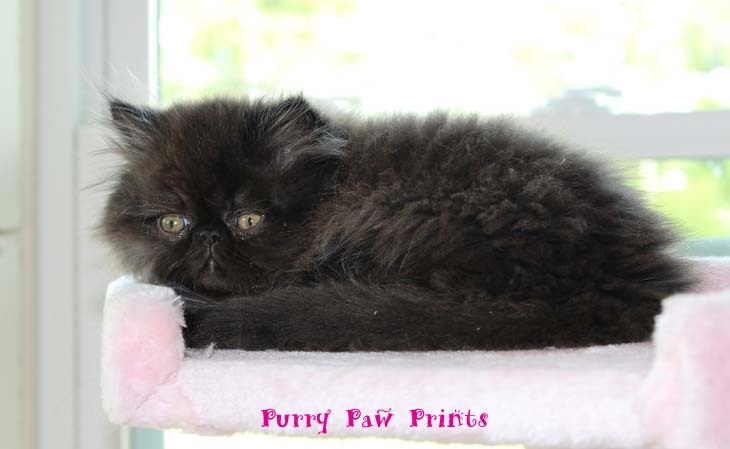 Watch the latest videos of Primrose and Pansy's very rambunctious 6 and 4 week old Persian and Himalayan kittens in their new Toddler Room with their new toys and play stations. 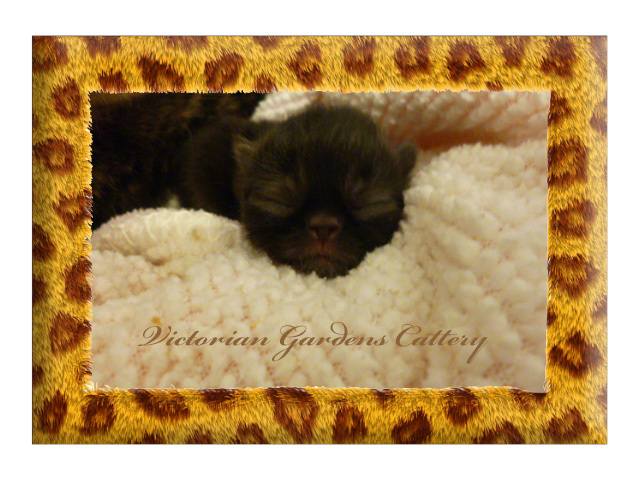 Pansy's one kitten is 4 weeks old. These babies are happy and very rambunctious. They love all their new toys and space. They are eating wet food, drinking from the water fountain and using the litter boxes. They are a delight to watch. You can see individual pictures of them in their Spring Has Sprung Photo Shot available on the mother's Nurseries pages. Just click on the link to be taken to the YouTube video. 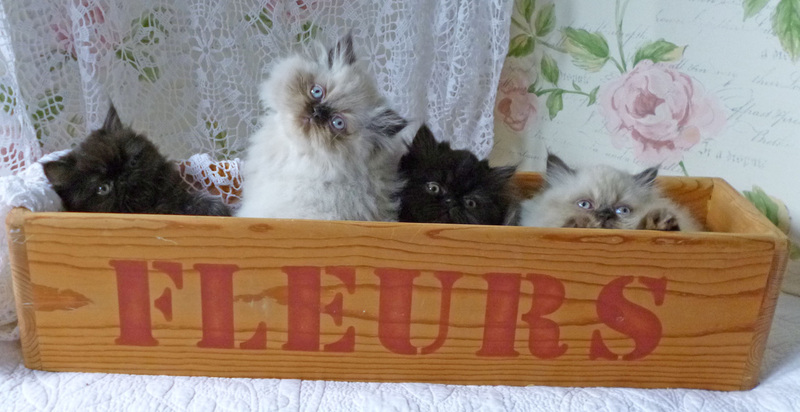 We had 649 photos taken during our Spring Photo Shoot between Pansy and Primrose's babies. We picked the best of over 100 to display in our Spring Has Sprung Photo Shoots. Please click on the picture to be taken to Pansy's baby's photo shoot. Tomorrow he will turn 3 weeks old. He is almost up to Primrose's babies in weight. He is walking all over the place. He has great teachers in Primrose's babies. He follows right after them and is even playing with them now. He is such a beauty and so photogenic. Time is going by so fast as Pansy's baby grows and grows and grows. Before I know it, he will be leaving for her forever home. Pansy and Primrose make the great team as they work together to nurse and attend to every need of this blended family of two litters. It is so precious to see the bond that they have for one another and the bond they have for each others babies. If you ask Pansy, she would say they were all her babies and Primrose would say the same thing. There is not competition or fighting, just honest and loving team work. It is a blessing. The babies are all doing great. They are all walking. Pansy's baby's eyes opened several days ago. I am so glad he was able to have siblings in Primrose's babies. It would have been lonely for him to be by himself. I am glad that the litters were blended together. The bond is tight. You can click on the link below to go to the YouTube video for today. Just take a look at the beautiful face of Pansy's baby. 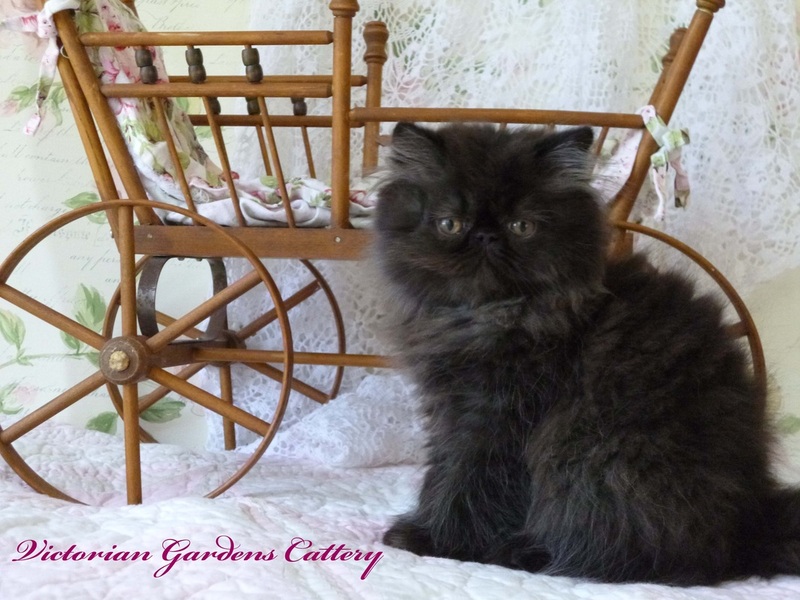 We had to lighten the photo of Pansy's black Persian boy since it is hard to photo a black kitten and still see the features. He is a beautiful extreme face. Pansy is trying out a new way of nursing her on her back. When she was pregnant, she would lay this way a lot. This baby is almost caught up with Primrose's smallest baby at this point in time. He eats like a horse, just like her mommy. He is just too precious. He was instantly a cuddlier. He loves to snuggle under the cuddle blanket as far as he can go. He has the most gorgeous silky and shiny black coat. His little cobby body is perfect. I think I am in love. Pansy and her 12 hour old newborn Black Persian female. 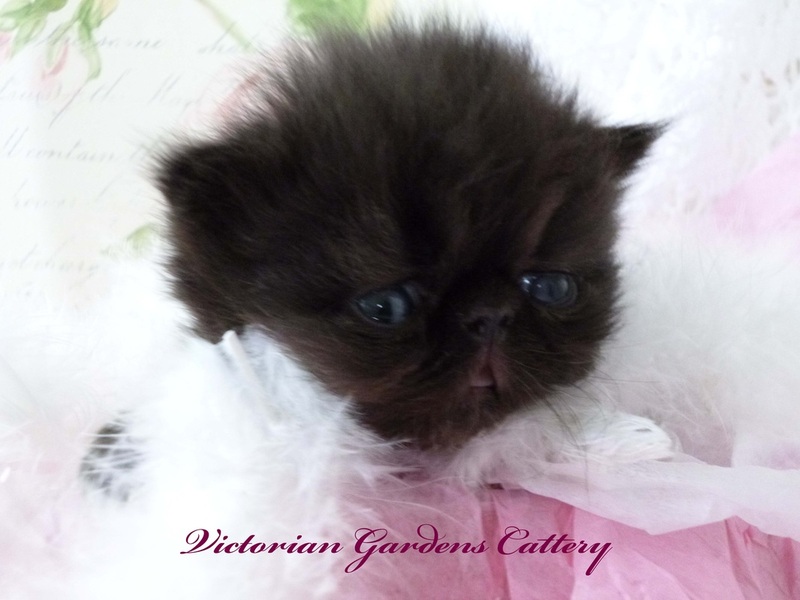 At 2:45 a.m. this morning, Pansy delivered a very healthy large Black Persian male. This baby is very cobby and heavy boned. Right now, it looks like he may be an extreme face. He has a beautiful silk coat which is going to be a breeze to take care of. He weighted in at 94 grams which is large for my Cattery standards. Within the first 10 hours, the baby added another 10 grams to make 104 grams. At this rate, Pansy's baby will be caught up to Primrose's babies in no time. God perfectly knitted this baby together in the womb. The baby actually looks the spitting imagine of The Perfect Dahlia. 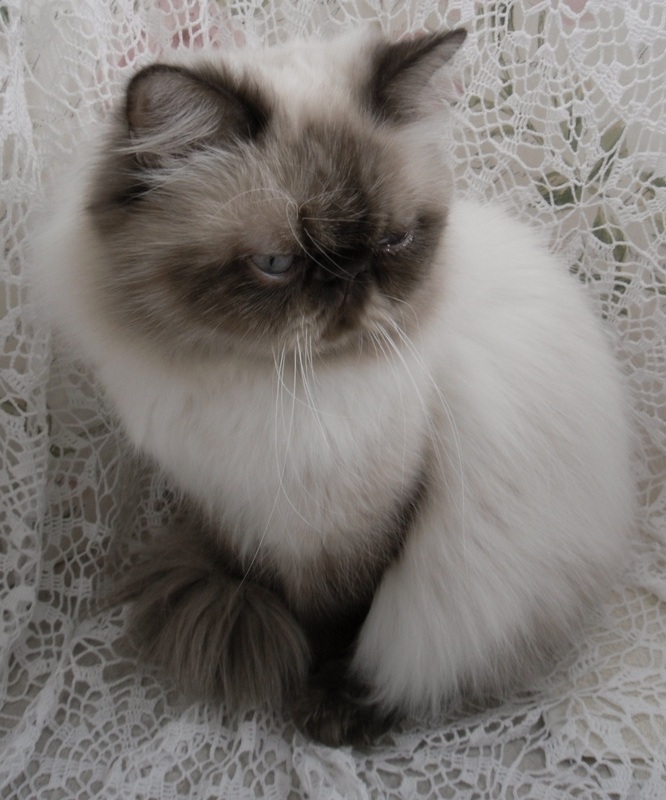 He has the same face shape and silky black fur that Dahlia had at birth. The baby is also a chocolate carrier and possibly a dilute carrier. Pansy of course is looking around for more kittens to nurse. We have brought in one of Primrose's babies to nurse on Pansy for a while and this seems to calm her down. We will continue to do this till her true milk is in. We had Pansy and Primrose in the same room in the early morning hours but they both were protective of their babies. So Pansy is now in her own nursery. In a week we may try putting them in the same room. They are mother and daughter and are use to each other and have a very good relationship. You can watch the first video of Pansy and her baby taken approximately 11 hours after the delivery. Hope you all enjoy it.